You are here: Home / Puppies / Should You Microchip Your Pet? Pet owners often find themselves faced with the question: “Should I microchip my pet?” It’s normal to feel doubtful about this matter, but we are happy to help you make up your mind. First things First – What is a microchip? 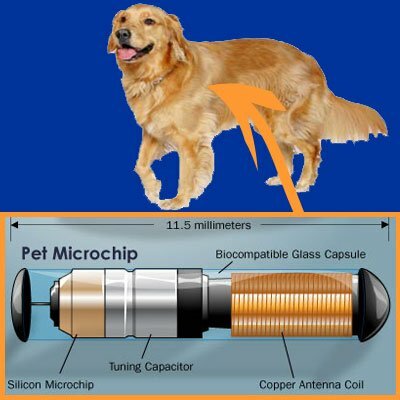 A microchip is a small electronic device usually implanted in the scruff of your pet’s neck. The chip’s about the size of a grain of rice, and doesn’t cause any pain for your dog. The information this chip carries is a number. This number along with the details about the pet owner is recorded on a central computer registry. Although microchips are for identification, they won’t track your dog. Your dog has to be taken somewhere to be scanned. The biggest advantage these devices have over other forms of identification – such as, a tag or collar – is that they can’t be removed, they can’t be lost. Why does my pet need ID? Being in the dog realm, we can assure that losing a dog is any owner’s biggest fear. If your dog gets lost, whether it’s close to home or far away in a field, without a proper ID it will be impossible for anyone to get in contact with you or bring your pet home. Most lost dogs without any identification end up in a rescue shelter. Then, if there’s no contact with the owner then the dog is re-homed or euthanized. All rescue shelters and vets have microchip scanners to quickly identify any stray or injured animal, contact its owner and start the necessary treatment without any delay. An ID can help people who find your dog find you and if someone else claims your dog is their pet, you can prove that it is yours. Will the microchip hurt my dog? As mentioned earlier, the chip is only about the size of a grain of rice, and does not cause any pain to your pet. It is encased in a glass polymer so that absolutely no irritation is caused. The procedure to implant the microchip is easily done using a needle. Sedation or anesthesia is generally not required. The decision whether to microchip your dog or not is easy. You should definitely microchip your dog as soon as possible, so you can rest easy knowing that if anything happens to your furry companion, you’ll have a better chance of recovering him or her. When it comes to your dog’s safety and well being, many vets agree that microchipping is a priceless technology and many even argue that it should be mandatory. Whether the microchip is ultimately used to reunite a missing pet with its family or to deter criminals from victimizing your pet, it would be safe to say that microchipping would be a useful thing. It would minimize strays, euthanasia rates, and shelter crowding—all animal problems that are getting worse every day. Just like every vehicle has to have an identification number and a license plate, for a dog lover, a dog is more valuable than a car. You’ll never regret having your microchipped, but if your furry companion gets lost, you’ll always regret that you didn’t. If you would like to have more information on microchipping then speak with your veterinarian. Is Your Pet Microchipped Or Do You Have Plans to Microchip Them? If so, why or why not? We’d love to hear. Comment below.